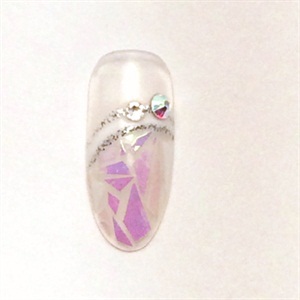 Glass nails are trending. While most nail techs are opting for mylar or foil to create the shattered effect, nail tech Kim Bui created the look using origami paper. “I decided to use origami paper to experiment with not only paper itself, but the holographic layer as well,” says Bui. “I found it to be a sturdier material. 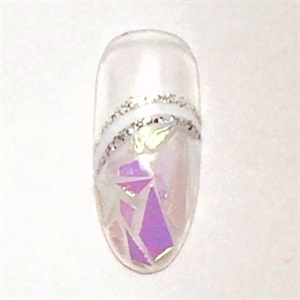 The larger sheet allowed for more custom pieces to tailor it to the exact shape and length needed for each nail.” Since the holographic trend is in high demand right now, Bui says pitching this look to clients can be easy. “It’s edgy. Literally! The look has softer elements that can appeal to a variety of clients,” she says. 1. Apply gel base coat and cure. Using a detail brush, paint an arched, curved line across the nail with white polish. Create a thick or thin width depending on your preference. Cure. Apply a second coat if necessary. 2. 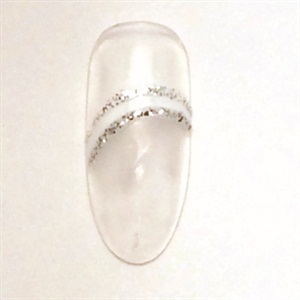 Paint a line above and below the white, following the shape, in silver glitter gel using a detail brush. Cure. Add another coat if more glitter or opacity is needed. 3. 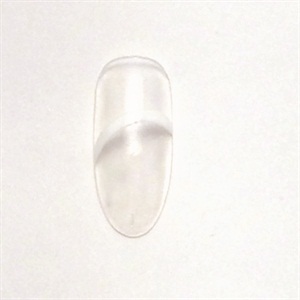 Using a clear gel base coat, apply a thin layer to the lower half of the nail. This is where the origami paper will fill in the design. Place the paper on the nail and allow it to saturate for a minute or two. This is where you can get creative! Play around with shapes and placements until you create the desired design. When you have finalized your design, cure to hold into place. Pro tip: Precut origami paper in a variety of shapes and sizes to help create a shattered effect. The glass effect is achieved more by using longer, pointed, and angled pieces, as opposed to multi-angled pieces, which create more of a mosaic effect. 4. 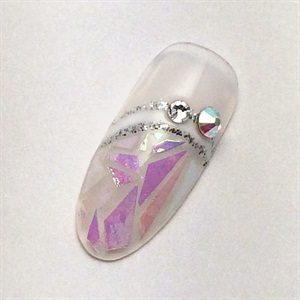 Using glue, place two rhinestones or crystals toward the top of the design. 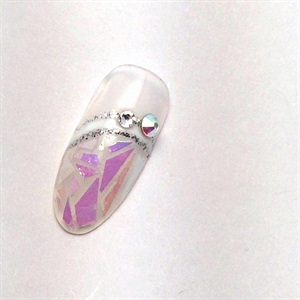 Bui used one medium sized Crystal AB Swarovski and a smaller clear Swarovski. 5. Coat the whole nail in a clear gel top coat and cure. Be sure to avoid coating the crystals as to not cover the facets to keep the shine. To see more of Bui’s work, follow her on Instagram @sincerelykimbui.